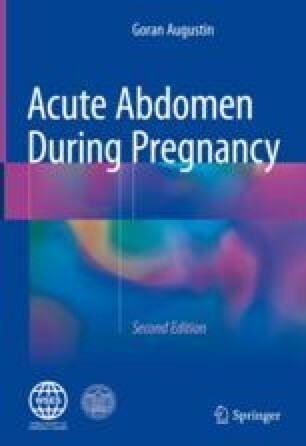 Complex ovarian mass is a separate entity from adnexal torsion which is only one presentation due to ovarian mass and is described in detail in a separate chapter. Complex ovarian mass found in pregnancy is important for several reasons: (1) adnexal torsion, as a result, should be detorsed immediately to preserve ovarian function, (2) persistent pain, (3) ovarian mass rupture and bleeding, and (4) tumor with malignant potential. Persistent pain or compression of surrounding structures is important because it commonly does not subside without surgical intervention. The timing of the operation is critical because intervention during the second trimester carries the lowest risk of obstetric complications. Intra-abdominal bleeding is difficult to diagnose initially, especially if bleeding is small. Bleeding from ovarian mass is always the indication for immediate operation. The most difficult issue is asymptomatic and small ovarian mass. Small ovarian mass can commonly be treated conservatively if the malignancy is excluded. There are different imaging and non-imaging methods for confirmation of malignancy. Malignancy status determines the timing and the type of treatment intervention.